It’s almost that time of year again – the time that’s usually welcomed by parents and cringed at by kids: back-to-school. With summer vacations ending, parents spend a lot of time getting their kids ready for school. 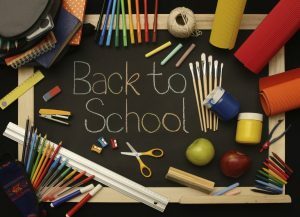 New school supplies, haircuts, and special end-of-summer outings all play into the back-to-school routine. There are some other things that parents can do for themselves and their children to ensure a smooth transition into the school year, too. Going back to school doesn’t have to be a grueling task for you or your kids. Take a look below at few ways to get this year off to a great start in your house. Simplify your morning routine as much as possible. Do as much as you can the night before! Pack lunches, get homework and backpacks ready, lay out clothes for the next day. Involve the kids in this the day before! They can help get their own things ready for the following day. If you are leaving with the kids in the morning have your things ready to go also. Control the paper! We all know that once school starts the amount of paper that starts coming home is insane! Don’t let it pile up! Set up something in your house (file folders, a magazine holder, anything with slots in it) to hold important papers. Set up a staging area. Find a central spot to store everything related to school, including backpacks, upcoming outfits, and a dry erase calendar with family schedules. Try to keep this area free of clutter and other non-school items so that you can find what you need, when you need it—and quickly. Have the kids help you stock it with school-related items and keep it clean and functional. Talk to your kids about bullying. Research shows that one in three kids experience bullying at some point in their school career and in the increasingly digital world, the consequences can be extreme. Make sure your kids understand the right way to treat their peers, and when to speak up if they see someone else being bullied. Also make sure they know when to come to you if they feel they are being bullied. Ask your kids about their concerns. The start of school is exciting, but can also bring some anxiety, especially when it comes to the unknown. Take a few minutes to ask your kids what they are most looking forward to during the school year, and what things may be worrying them. By giving them a forum to express their concerns, you can help them work through any worries in advance of school starting and clear up any issues that could lead to a bumpy start to the year. Let us know if The Hazel Agency can assist in providing your family with an extra set of hands. Please feel free to contact us at 770-643-2034 or visit us on the web at www.thehazelagency.com.